I quite love OneNote. It feels amazing, the way it works so similarly to how I would work in a notebook - allowing me to cut and paste all over the place, taking text formatting and promoting it to be active (such as bullet point lists out of asterisks) and all the subtle little things - like the screen capture or picture to text capability. For example, check this out! Why don’t more people use pasta water at home? Sometimes I thought it should he bottled, because there is no way that your home water could ever achieve the starchy viscosity of a restaurant’s. Ir would be cheap—being liquidy leftovers—and the jar should he very large, probably darkly tinted, like a vine bottle, because there would he no reward in looking too closely at what was floating inside. The thought also made me curious about the monwnt in the history of American cooking when efficiency won out over taste and, instead of using a pair of tongs and pulling the spaghetti straight out of the pot, people starwd using a colander (an evil instrument) and letting all that dense, murky rich “water” rush down the drain. The practice ¡s described in the original, 1931 edition of Tut’ Jmt of Cooki,, in its “Rules for Boiling Spaghetti, Macaroni, Creamettes and Noodles,” along with the even more alarming one of taking your colander full of spaghetti (rather mushy, since you’ve boiled it for an hour) or macaroni (easy to che after being boiled For twenty minutes) or creamettes (no longer a supermarket item, alas, but once the essential ingredient ¡n a baked creamette loaf) and rinsing it ¡n cold warer—oh, heresy of heresies—just to make sure nothing ¡s clinging to ir. I hold the author responsible for the many plates of sauce—heavy spaghetti that, as a fea ture of my own American childhood, were prepared by my mothei who was born two ‘ears after the cookbook was published. To be fair to both my mother and the authoi; a plate oF spaghetti with meat sauce remains an eternal comfort food, even if the meal was not about the pasta. 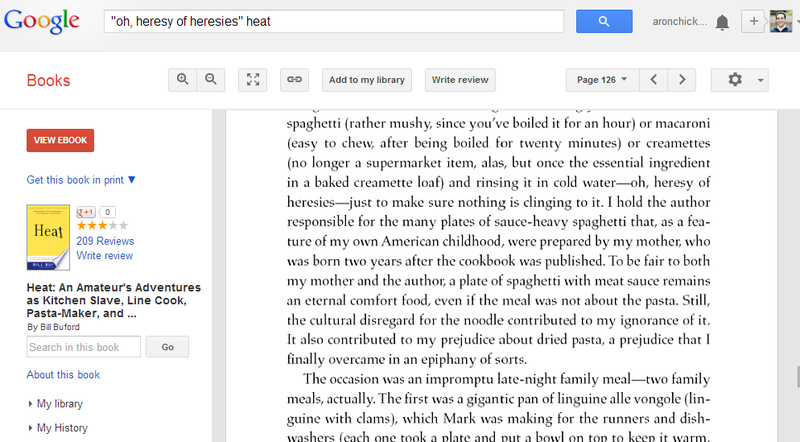 Still, the cultural disregard for the noodle contributed to my ignorance of ¡t. It also contributed to my prejudice about dried pasta, a prejudice that I finally overcame in an epiphany of sorts. Pretty outstanding! It's not perfect (the bolded / underlined portion is where OneNote tried to handle italics), but saved me at least twenty minutes. However, in my current project to eliminate all extraneous paper and article clippings, I'm not using OneNote - I'm using Evernote, which I consider to be a much worse interface. Why? It's just more ubiquitous on input. I can clip from Web pages, my phone, my iPad, my Mac and so on in a much more fluid way and that makes all the difference. I'll definitely check it out Nate, I hadn't heard that!